Reverend William Graham’s grave on the grounds of Washington & Lee University, Lexington, Virginia. Our History on the Land class here at the University of Vermont is all about reading the landscape, using it as an extension of our written history. Rather than looking at history based on important people or key events, a version of history that leaves out quite a bit, you look at the town itself and how it formed and evolved over time. Town planning, transportation (rivers, railroads, roads, etc. ), agriculture, industry, business districts, neighborhoods and suburbs, and everything else that makes up a town or city weaves together to build a history. There’s so much I could talk about, and perhaps I will in the future, but Thursday’s class brought to mind a piece of our history that is frequently forgotten. We were covering types of communities that were created with a very specific purpose, like company towns or utopian religious communities. These utopian religious communities were usually founded as a place for specific religious groups, such as the Anabaptists (Amish, Mennonites), Harmonists, Quakers, Shakers, and Transcendentalists, to practice their religion freely. One such community, intended for Scotch-Irish Presbyterians, was founded right here in Mason County. Born in 1746 near present-day Harrisburg, Pennsylvania, William Graham was accustomed to life on the frontier. Raised in a deeply religious Presbyterian family, he studied under local ministers until his enrollment at Princeton University in 1769, where he studied theology and moral philosophy. Soon after graduation, in the fall of 1774, a fellow alum approached him about a teaching position at the Augusta Academy in now Rockbridge County, Virginia. He readily accepted, and it wasn’t long before he was also ordained as a minister with the local Hanover Presbytery, covering the congregations at Timber Ridge, Hall’s Meeting House, Brown’s Meeting House, North Mountain, and the Pastures. Members of these congregations included many who had recently fought at the Battle of Point Pleasant. Throughout the Revolution, Graham did what he could to keep the now renamed Liberty Hall Academy alive. It struggled due to a lack of students, as men were off fighting in the war, but he was able to retain a small class and move the school to Timber Ridge, and eventually to the growing town of Lexington. Following the war, he saw to the revival of both Liberty Hall and the local Presbyterian congregations. For a time he resigned as minister to focus on the school, but returned in the 1780s and added yet another congregation, this one in Lexington proper. Today, the school survives as Washington & Lee University. Soon afterward, Graham resigned as both educator and minister, with a plan to return to farming to better support his family. Knowing that it would be difficult and expensive to purchase a large farm in the Shenandoah Valley, he looked further west, and arranged to purchase 6,000 acres in the Ohio Valley for $18,000. This consisted of everything from Union Campground Road to Broad Run Road, and as far out as the Upper Flats/White Church area. However, there was a problem. When he arrived, he couldn’t find the property markers mentioned in the sale. Weather also delayed his return east, and he was sued for lack of payment. To raise the money, he sold his property in Lexington and began selling lots on his new land to faithful Presbyterians, hoping to establish a religious community. This worked, to a point. A few families, among them the Mitchells, joined Graham and a small settlement and blockhouse were built. However, in the fall of 1797, he discovered that the land speculators who had sold him the land did not actually own it! In fact, it was part of a land grant given to John Polson for service in the French and Indian War. Polson, who was then living in England, agreed to sell the land to Graham for $9,000, half of what the others were asking. Graham agreed, and this was folded into the nonpayment lawsuit. In the spring of 1799, he returned east once again to finalize his affairs and settle the lawsuit, but on the way, contracted pneumonia. He died at the home of a friend in Richmond in June. His remains were later reinterred on the grounds of Washington & Lee University, whose success he had helped ensure. Without Graham, the goal of a Presbyterian community on the Ohio River collapsed. Many of the families who had joined him left, though the Mitchells remained, and Graham’s heirs sold the land to the German Lutheran Roush and Siegrist families, among others. Today, physical evidence of Graham’s settlement has been lost. It is thought to have been located where the Mountaineer and Philip Sporn power plants now stand. Though, his legacy survives in the name of Graham District, Graham Baptist Church and Cemetery, and the often forgotten community of Graham Station. Information from Mr. Robert Gillespie’s master’s thesis “Reverend William Graham, Presbyterian minister and rector of Liberty Hall Academy,” Mildred Gibbs’ “Founding and Development of New Haven,” History of the Lexington Presbyterian Church, and other online biographical entries. On Monday, April 8 at 6:30 p.m., concerned members of the Historical Society and Main Street, along with other experts in historic preservation, will be speaking at the Point Pleasant City Council meeting regarding the Point Pleasant River Museum building. 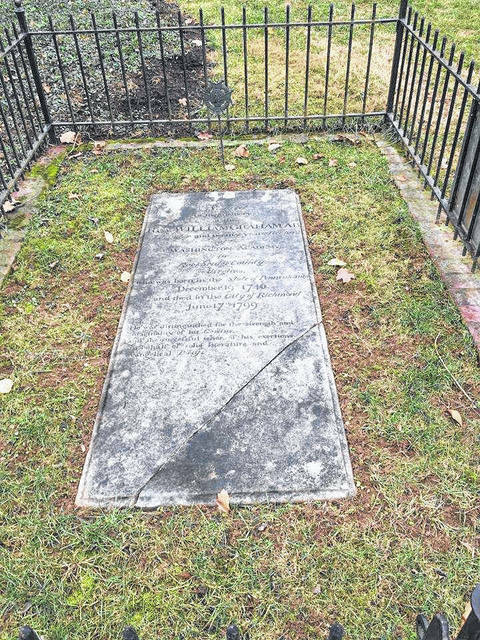 https://www.mydailyregister.com/wp-content/uploads/sites/24/2019/04/web1_4.6-Graham.jpgReverend William Graham’s grave on the grounds of Washington & Lee University, Lexington, Virginia.